The commander of the Apollo 14 mission, Alan Shepard holds several unique distinctions. He is the only member of the Mercury 7 astronauts to have walked on the Moon and also the oldest person to have walked there (in terms of age at the time he did it). His mission was the first to broadcast colour video from the surface of the Moon and made the most accurate landing of all the Apollo missions. And, of course, he is the first man to have hit golf balls (two of them) on the Moon. Shepard came home to the hero’s welcome that astronauts traditionally received, and was promoted from Captain to Rear-Admiral after the successful completion of his mission. He retired from the US Navy and NASA, becoming a successful businessman, and eventually died from leukemia in 1998, 21 years to the day from Armstrong’s first moon walk. 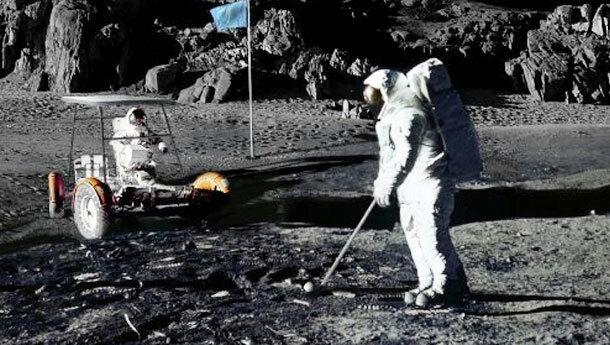 His golf balls are presumably still somewhere on the lunar surface. Tagged 1971, Alan Shepard, Alan Shephard, Apollo 14, Apollo program, Can't Keep Johnny Down, Feb 6, Moon, They Might Be Giants, TMBG.